Welcome to the Math Salamanders Free Online Learning Math area. Here you will find links to our online math tests and practice zones where you will be able to test and practice your math knowledge and skills. There are a range of tests to help you learn your addition facts, multiplication tables, test your fraction and decimal knowledge and much more! Bronze awards represent good achievement: 70% or above. As well as the percentage of questions answered correctly, the awards are also dependent on the time taken to answer the questions! In our Math Place Value Practice area, you can practice your digit value skills - knowing what each digit in a number is worth. You can also practice your place value combining of thousands, hundreds, tens and ones. You can even use this area with decimals: tenths and hundredths. In our Rounding Practice zone, you can practice rounding a range of numbers. You can round numbers to the nearest 10, 100 or even 1000. Want to round numbers to the nearest decimal place, you can do that too! In our Number Bonds Practice area, you can practice your number bonds to a variety of numbers. Test your numbers bonds to 10, 20 , 100 or even 1000. Want to try decimals - you can do that too! Here is our online learning math addition zone, where you can practice a range of integer addition calculations. adding decimals with up to 2 decimal places. Here is our online learning math subtraction practice area where you can test yourself on your subtracting skills. 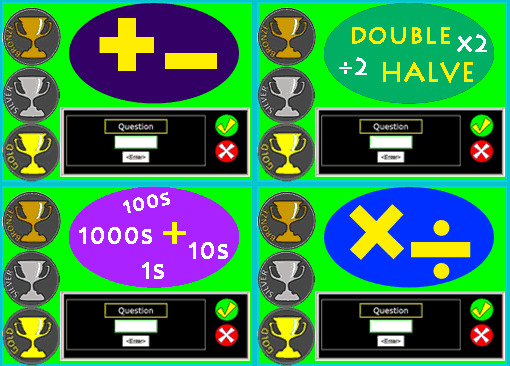 Here is our online learning math practice zone for times tables and multiplication facts. Using this zone is a great way to test yourself on your facts and see how many you can do in a minute, or see how quickly you can complete the jigsaw. Then re-test yourself and see if you can improve your score. Use the Times Tables Zone if you just want to practice your times tables. Use the Multiplication Zone if you want to practice multiplying whole numbers or decimals by 10s or 100s. practice multiplying whole numbers by 10 or 100.
dividing by 10 and 100. Here is our online learning math addition and subtraction practice area. Practice and improve your addition and subtraction facts here. + and - facts to 10, 15, 20, 50, 100, 500 or 1000.
adding and subtracting hundred(s) to/from 3 digit numbers. Here is our online math zone for practicing multiplication and division. This generator generates random questions with both multiplication and division calculations. Here you will find our very own money zone to create tailor-made money quizzes to practice. You can choose what value you wish go up to, and whether you want to add or subtract money amounts. money addition and/or subtraction up to $1, $5, $10, $20, $50 or $100. adding in cents (or pence) up to $1 (or £1) with no decimals. If you need to practice your halving and doubling, then why not try out our Online Halving and Doubling Online Practice Zone. Take a look at our NEW Online Fraction Practice Zone for finding fractions of numbers. Take a look at our NEW Simplifying Fractions Practice Zone for finding the simplest form for a range of fractions. You can choose from proper fractions, improper fractions or both. Our online percentage practice zone gives you a chance to practice finding percentages of a range of numbers. You can choose your level of difficulty and test yourself with immediate feedback!